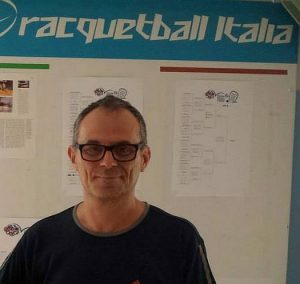 This article was originally published by the European Racquetball Federation on November 22, 2017. 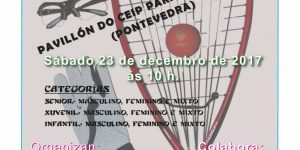 ———- Another European One-Wall-Tournament will be held in Pontevedra, Spain on December 23rd. The event is sanctioned by the World Outdoor Racquetball Association and the European Racquetball Federation. Article originally posted by Nederlandse Racquetball Associatie and the European Racquetball Federation on Facebook on November 22, 2017. ———- It is official: The Dutch Open return to the European circuit in 2018. 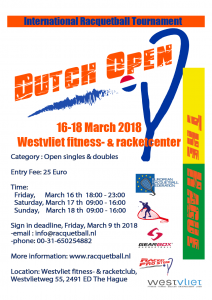 The event will be held on Mach 16-18 in The Hague, Netherlands at the Westvliet Fitness & Racketclub. The event was not held in 2017 due to the European Championships there were also held in The Hague. Competition will be offered for Open Singles and Doubles. Please find more information at www.racquetball.nl. 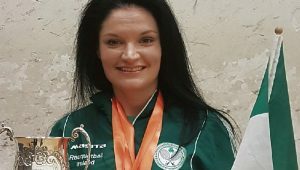 Introducing our champion: Donna Ryder Donna Ryder won her first European title in The Hague. Recently she won the Irish Open title as well. Time to get to know our top female player a bit better. Name, age: Donna Ryder, 27 years old. Club: Playing at the Newport Racquetball Club. 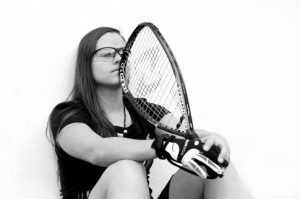 Gear: Pro Kennex racquets and Roll Out gear Career: Playing-13 years (since 2004); junior teams include Mexico(2005), USA(2006), Bolivia(2007) & Dominican Republic(2009) Senior Worlds include-Ireland(2008) Canada(2014) & Columbia(2016) Europeans-Germany(2011) Italy(2013) Netherlands(2017). Donna is coached by Jim Winterton. Great pics from the EURO 2017 Professional pictures and some awesome action shots from the 19th European Championships in The Hague, Netherlands are now online at https://goo.gl/v6MJBy. 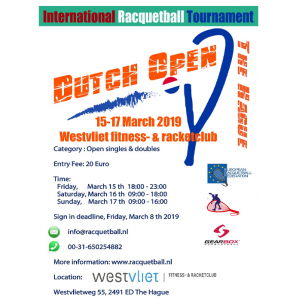 Thanks to Ken Fife, racquetball player and professional photographer from the US, but currently residing in Vienna, Austria, for accepting the invitation to come to The Hague and cover the action and for giving us great material to showcase and market the greatest sport on earth. Over 10.000 pics were taken during the competition days. The 19th ERF European Championships was held in The Hague, Netherlands. The event was held at the Westvliet Fitness- & Racketclub in The Hague. The date for the EURO 2017 was 13th-16th September 2017. Introducing our champion: Johnny O’Keeney Johnny O’Keeney (Ireland) was crowned European Champion in Men’s Singles. 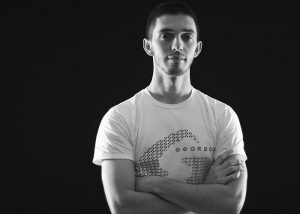 In the finals he beat Arno Schmitz (Germany). Time to get to know our new champion. Name, age: Johnny O’Keeney, 27 years old. Club: Playing since 2001; playing at the Fermoy Racquetball Club.